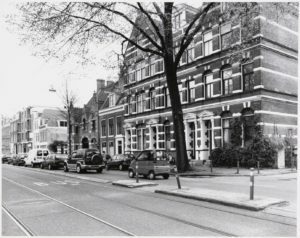 From 1965 through 1973, Robert Gorter studied medicine and did his specialty training at the State University of Amsterdam (at that time the University was still called the Municipal University of Amsterdam / Gemeentelijke Universiteit van Amsterdam). 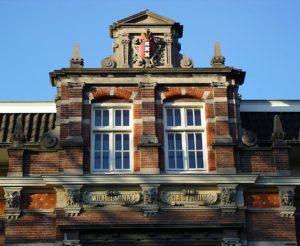 The current University of Amsterdam (UvA) has its roots in the seventeenth century. 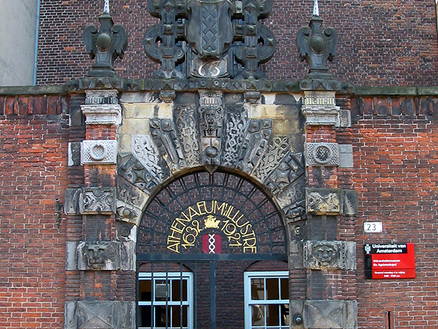 In 1632, during the Dutch Golden Age, the “Athenaeum Illustre” was founded in Amsterdam to train students in Trade and Philosophy. 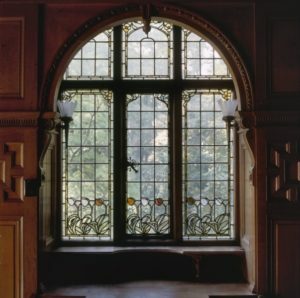 Because the Athenaeum Illustre was not yet a proper university, classes were usually taught in professors’ homes. 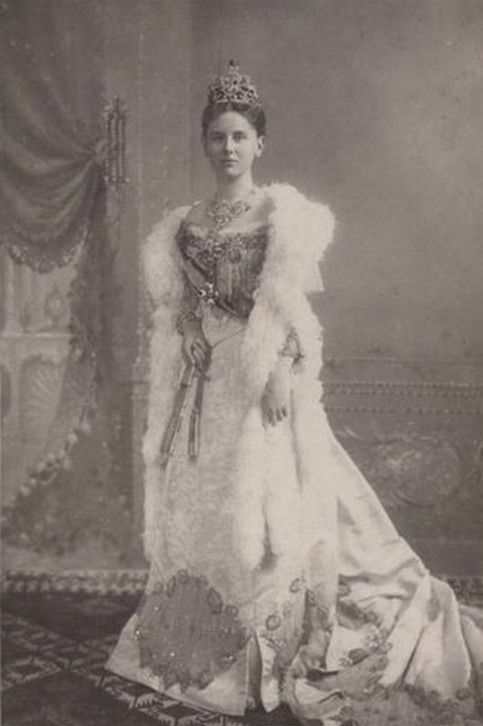 Until the nineteenth century, the Athenaeum remained a small institution with no more than 250 students and eight teachers. This changed in 1877, when the “Athenaeum Illustre” became the University of Amsterdam and was permitted to confer academic degrees. From the two subjects offered by the Athenaeum Illustre, the UvA has expanded into a comprehensive university with seven major faculties, namely: Economics and Business, Dentistry, Humanities, Law, Medical Sciences, Science, and the Social and Behavioral Sciences. Collectively these faculties conduct research and education in over sixty disciplines. The University’s strong historical bond with the city has remained throughout these changes till today. The intellectual atmosphere at the UvA is both critical and socially engaged. The University’s scholarly research has an excellent national and international reputation. 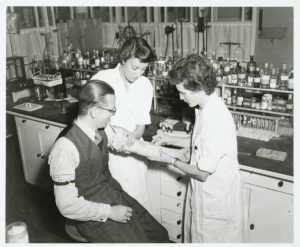 Research at the UvA is frequently interdisciplinary, and staff and students are encouraged to push the traditional disciplinary boundaries. With nearly 30.000 students and 5.000 staff, the UvA is one of the four ‘classical’ comprehensive universities in the Netherlands. This means that it offers a wide range of programs. ‘Classical’ also means that education is seen as valuable in and of itself and is not just guided by the whims of the labor market. Above all, the UvA seeks to provide a place for the development of talent, where students and researchers alike are brought into contact with diverging and sometimes conflicting points of view. In short, the University is a place where students learn to think creatively in an original and independent way. 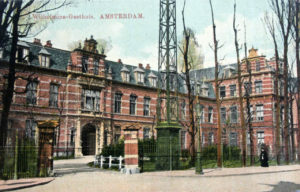 Thinking creatively and independently was not always welcomed by the professors of the Faculty of Medicine where Robert Gorter studied. Unfortunately, the students were taught and prepared for their exams and almost all examinations were oral. When Robert Gorter graduated as a Medical Doctor in 1971, he had been “exposed” to two multiple choice examinations ever. House no. 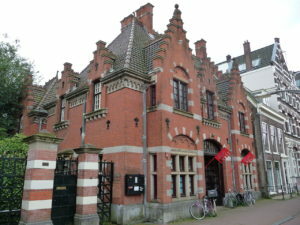 253 is part of a complex of buildings built on the premises of Villa Betty (built in 1877). 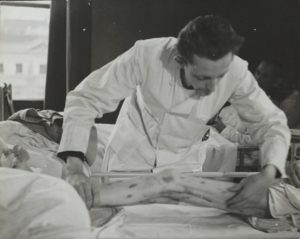 One of his professors at the Wilhelmina Gasthuis was the surgeon Ite Boerema (1902-1980) who, with his student Prof. W.H. Brummelkamp, developed, therapy with hyperbaric oxygen in over-pressured tanks with oxygen to improve poor tissue perfusion. Several times, Robert Gorter joined patients in one of these oxygen tanks or be available in case there was a medical emergency. Also, Boerema introduced hypothermia in cases of open heart surgery and hyperthermia in cancer patients (like Robert Gorter would develop later as part of the “Gorter Model”). Prof. Ite Boerema and Willem Jacob Gorter, the father of Dr Robert Gorter, were both Freemasons and met regularly. For colitis ulcerosa and Crohn’s Disease, Prof. Van Leeuwen (1923-2013) was a strong proponent of the “astronaut food” which consisted of pills and concentrated drinks with all essential amino acids and vitamins to feed over years these patients: but without any fibers or balk. Robert Gorter once asked some (critical) questions about the effects of this diet as all the patients Gorter witnessed and treated in the hospital or on an ambulatory basis were not doing better (actually, quite a few were getting worse). Prof Van Leeuwen did not like that at all that a student (at the bottom of the picking order) would questions his view that “astronaut food” would possibly worsen the condition of the patients as there was no roughage (fiber) left to regulate physiologic gut motility and digestion.Later, in his own day-care hospital in Amsterdam, he treated very successfully colitis ulcerosa and Crohn’s disease with daily small amounts of Cannabis sativa (CBD). His first high pressure oxygen tank was used at the Wilhelmina Gasthuis in Amsterdam in 1959. Initially, the tank was used to perform heart surgery. This specific tank is still in use (2017). Boerema was not only a productive publicist, but he also invested and applied hypothermie during open heart surgery and hyperthermia in treating cancer patients. In addition, he developed improved multiple surgical techniques. 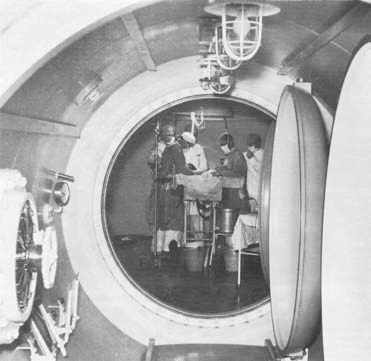 Then, in 1959, he opened his first hyperbaric chamber in the world: “the tank of Boerema” and he initiated this new technique which spread globally till today. 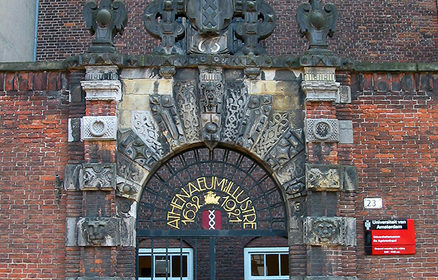 One of the many entrances of the teaching hospital Binnengasthuis (here seen from the Grimburgwal). Right in the middle of this picture is the original building of the Faculty of Pharmacy where Robert Gorter still learnt how to make suppositories, decoctions, infusions and powders to deliver medications with lactate (milk sugar) as a vehicle. Usually, lectures would start at 7.00 am and often, if anybody was one minute late, he would be refused to enter the auditorium (Dutch punctuality). 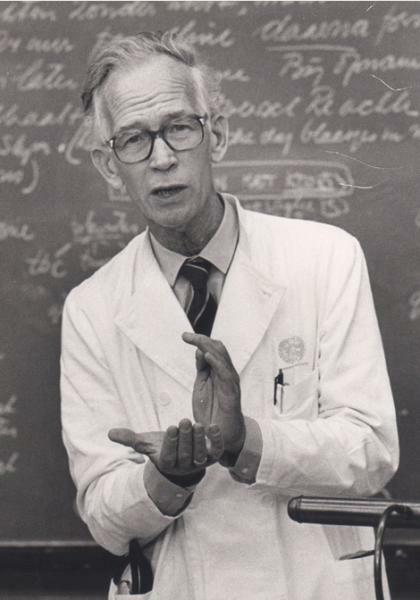 Robert Gorter attended daily lectures in both teaching hospitals and for the “Die-Hards,” he remembers the Saturday morning lectures by Professor Borst (Internal Medicine) whose preferred lectures were on hypertension, electrolytes and decompensatio cordis. Lecture halls ca. 1900 at the Binnengasthuis and at the Zoo (dierentuin called ARTIS). Please, notice that also women were accepted as medical students. 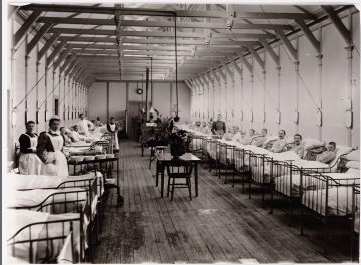 At that time and in many European countries, women were rejected from studying medicine and should better become nurses. In the Netherlands, with its republican and democratic tradition since the mid-1500s, women rights were (almost) equal to those of men: also in academia. Robert Gorter remembers vividly these years of attending lectures in these and similar auditoriums from 1965 till 1971. During the “Hunger Winter” of the winter season 1944 where during the German occupation of the Netherlands an estimated 15-20% of the Dutch population died from starvation during the severe winter. 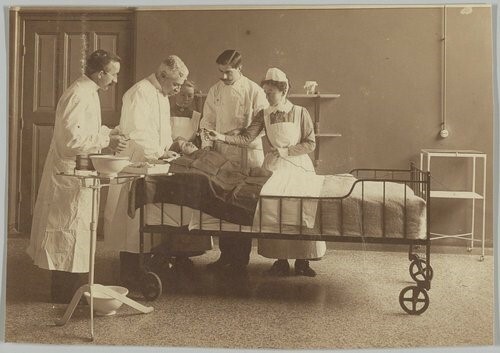 Here, a doctor at the Binnengasthuis, examining a patient who is close to dying from starvation. In 1968, Robert Gorter was able to rent a large house with 4 floors at the Overtoom253 and he turned that into a commune where at each floor 2 people would live but many things we done collectively. They were all students from the University of Amsterdam. 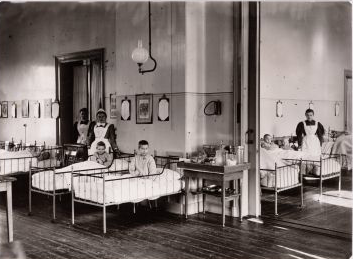 But, Robert Gorter was the only medical student who had to be with patients in the hospital or in lecture halls as early as 7.00 am. All others studied social geography, political sciences, English literature, chemistry, etc. 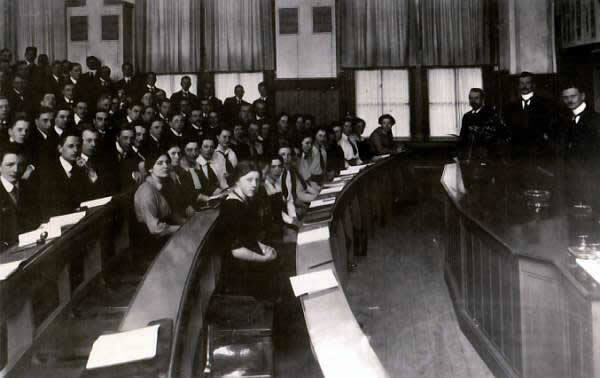 The lectures for these students never started before 11.00 am and thus, they were not in a hurry in the morning. Also, if they showed up late for attending the lectures, they were not rejected from entering as it was tradition with medical students. Robert Gorter never used Cannabis /marijuana / hashish as a recreational drug but all his nine friends in the commune would “blow” practically daily. Then, often far after midnight, they would start frying eggs, bake pizza, make coffee and be in a partying mood. 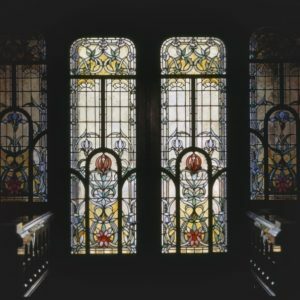 Regularly, Robert Gorter went then downstairs to one of the community kitchens and (usually friendly) complaint and ask them to keep the kitchen doors closed and play less loudly the guitar (the chemistry student Evert-Jan van den Heuvel loved playing the guitar and sing ballades and socialist songs, dedicated to the “Class Struggle”).In the kitchen, Robert Gorter was assured by all those attending the mid-night snack that smoking a joint / consuming Cannabis makes one hungry. 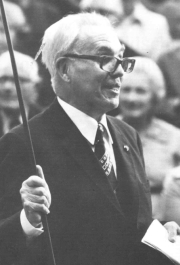 In 1973, when Dr. Gorter started his own day care hospital at the Weteringschans 72-76 in Amsterdam, called “Ita Wegman Huis,” he had lots of cancer patients right away and many of them complained about loss of appetite (anorexia) and severe weight loss (cachexia). Then, Dr. Robert Gorter remembered why he was so often waken up late at night in his commune: consuming Cannabis triggers your appetite. Thus, he started recommending Cannabis for severe weight loss. Also, he remembered that Barbara van Gelder, the girlfriend of Evert van den Heuvel, used Cannabis for menstrual cramps (dysmenorrhea) and migraine attacks half-way her periods. Thus, Robert Gorter also recommended patients with migraine to try Cannabis. Probably 90% of all migraine patients were very content with applying Cannabis and the cessation of their attacks. 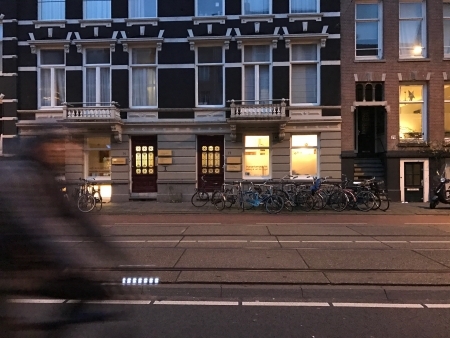 In 1982, when Dr. Robert Gorter immigrated to the USA, he donated these three buildings and the restaurant to the Foundation “Odin” (Stichting Odin) which was specifically founded to take care of these buildings and to protect its intended use for Anthroposophically-extended medicine and all senior therapists and doctors would manage the buildings and keep all medical and para-medical initiatives going. With 3.000 US$ in his pocket, Gorter left Amsterdam to make a completely new start in San Francisco, California, USA.